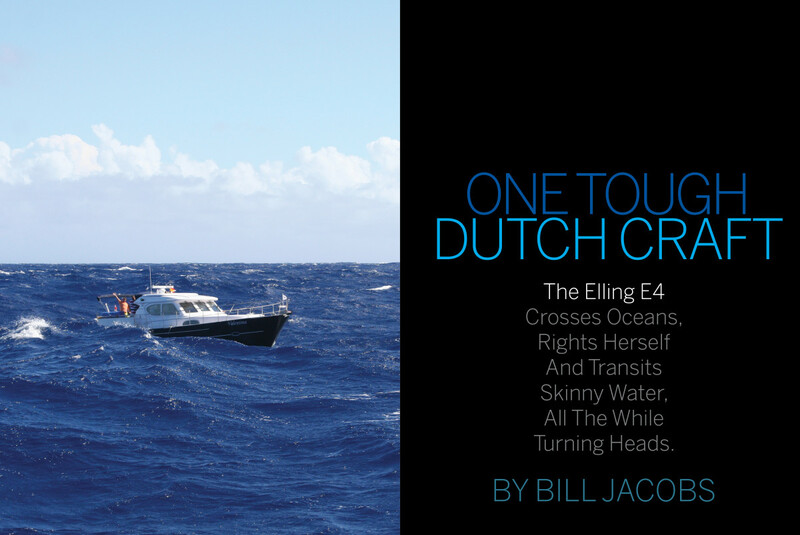 Contributor Bill Jacobs checks the pulse of the Elling E4; which crosses oceans, rights herself and transits skinny water, all the while turning heads. Watching a robust CE Category A boat built in the Netherlands gliding down the ICW in Ft. Lauderdale is like seeing a plaid-shirted lumberjack on the sands of Miami Beach. 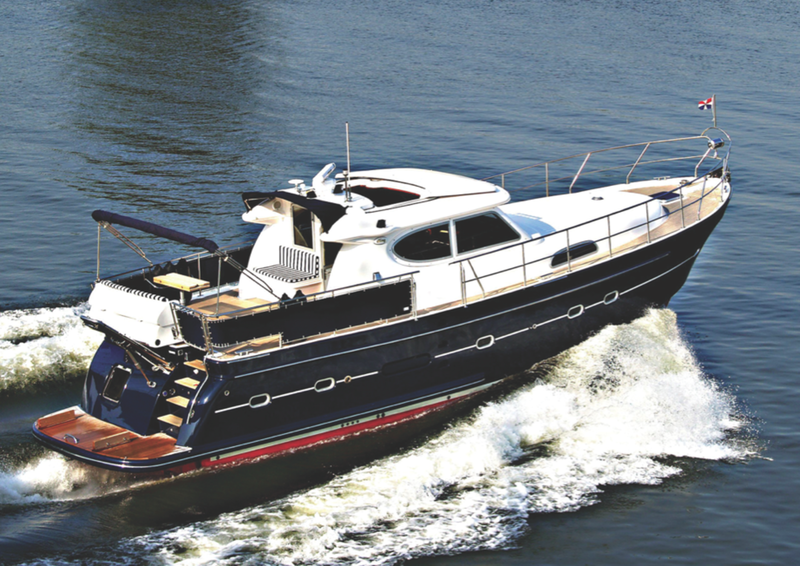 As with many other high-end pleasure boats built in northern Europe, the Elling E4 wears its workboat heritage like a badge of honor. How did a boat like this get here? Good question. Feliciano Robayna has spent most of his life around the water. In fact, much of that time was spent under the water. In 1974, as a young commercial diver, he moved from his ancestral home on the Canary Islands to Panama, helping to service ships as they moved through the Panama Canal. The hours were long, but the pay was great. After the United States turned the Canal over to Panama, however, the pay scale plummeted. 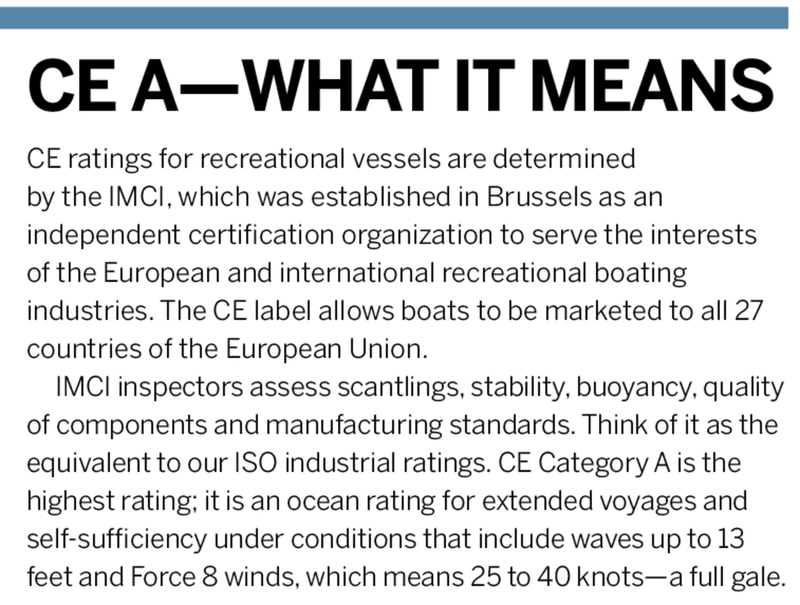 With a CE category A rating, the E4 is brave enough for any seas. That’s when Robayna started the Panama Marine Services Company. It has grown over the years to become one of the premier companies of its type in Central America, providing ocean-going ships with a variety of services ranging from crew recruitment, technical services, repair and ship supplies, to name a few. In 1998, Robayna began eyeing real estate for a vacation house in Ft. Lauderdale. After several years of looking, he purchased an existing home in the canal neighborhood of Las Olas. Although he had worked on, in and under commercial vessels all his life, he had never had time to own a pleasure boat. He first saw the Elling E4 sitting alone on a dock at the 15th Street Marina. 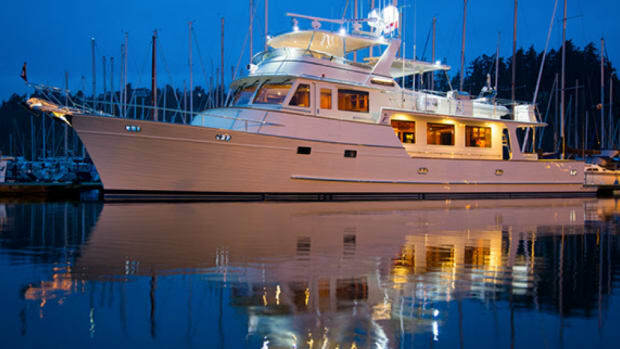 Her rugged appearance appealed to his sense of working boats, and at 49 feet she would be perfect for his 50-foot dock. 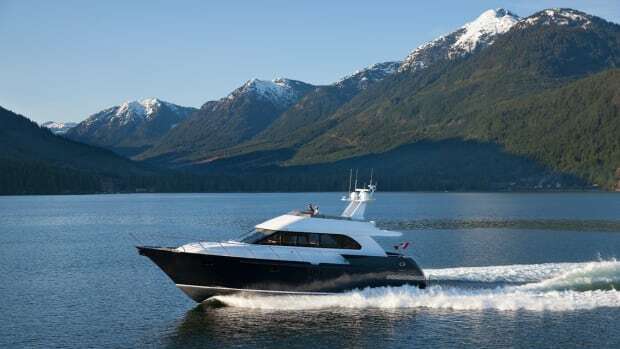 He learned that the boat was represented by a mid-Atlantic U.S. broker, so he called and was quoted a price that he felt was unrealistically high. A short time later he went back to see the boat again, and she was gone. She had been shipped back to the Netherlands after a falling out between builder and broker. Robayna contacted Neptune Marine Service BV, the boat’s builder, and spoke to Anton van den Bos, the company’s owner and president. 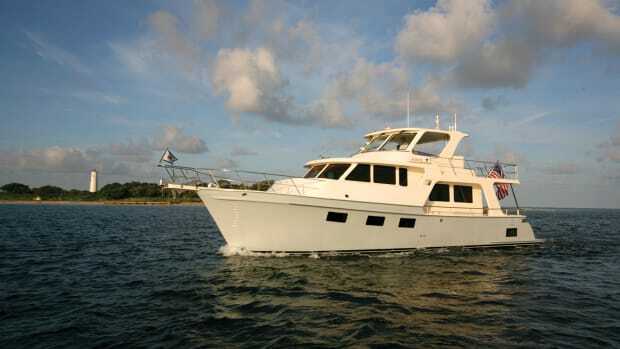 Robayna visited the factory and negotiated a fair price for the boat, which included replacing the carpeted cabin floors with a synthetic teak and holly sole, new cushions and fabric colors and allowance for new, state-of-the-art electronics and transportation back to Ft. Lauderdale. 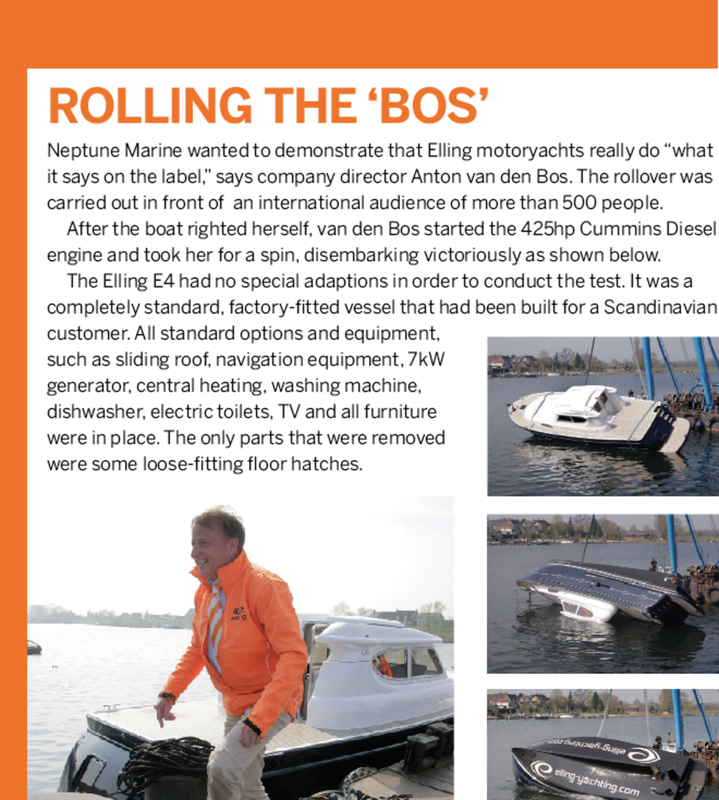 He took delivery of the E4, his first pleasure boat, in September 2013. He had also placed an order for a larger, more traditional steel trawler, thinking he would like something bigger and that he would sell the E4 upon receipt of the larger vessel. Now that Robayna has had the boat for six months, he is rethinking his plan, because the E4 does so many things so well that maybe he “got it right the first time.” He has developed a working relation with van den Bos in cooperation with a U.S. yacht broker, Judy Waldman. He has placed an order for a second E4 with a larger engine and is close to selling the large steel trawler to a European buyer prior to its completion. 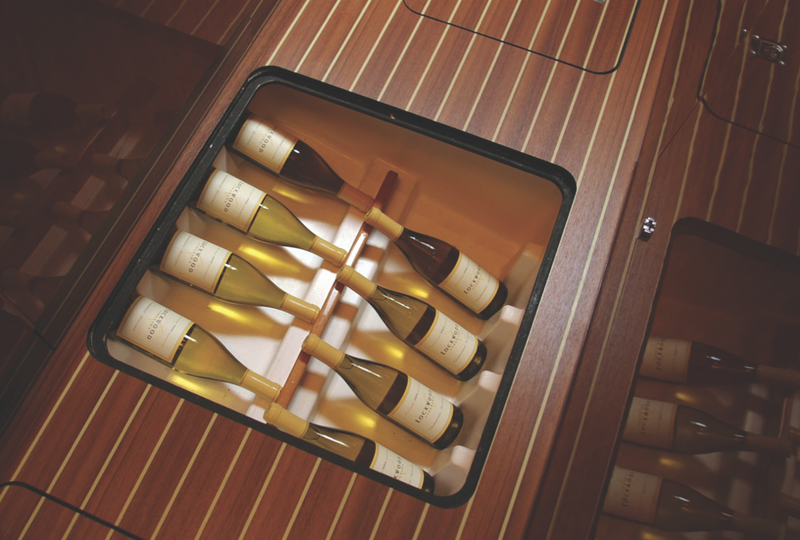 Among many other features, the E4 houses a wine cellar for owner enjoyment. The Elling concept was born in May 1997. Neptune began building the E series in 1998 with the E3. The E4 was introduced in 2006. The E4’s layout is similar to that of the E3, but with larger dimensions. So far, 324 Ellings have been built, 250 E3s and 74 E4s. With the two models sharing many components and production techniques, Neptune has achieved manufacturing efficiency resulting in high quality, cost savings and consistent, measurable results. Van den Bos developed his marketing message around this goal and rating, but after 10 years of production, no transoceanic passages had actually occurred. In 2007 three new E4s were sold to Russian owners. Their dealer in Russia had told them that “these boats really can cross an ocean.” The Russians were anxious to position their boats in the Caribbean for personal and charter use, so they decided to take the dealer at his word. When Van den Bos learned of this, he fully embraced the idea. The theoretical would become fact. Next came several months of planning the journey and equipping the boats with sufficient fuel, water and food to make the crossing. The E4’s standard fuel capacity of 400 gallons would not be sufficient, so after careful calculation, each boat was fitted out with additional barrels and jerry cans on the afterdeck, to roughly double the fuel capacity to 790 gallons. 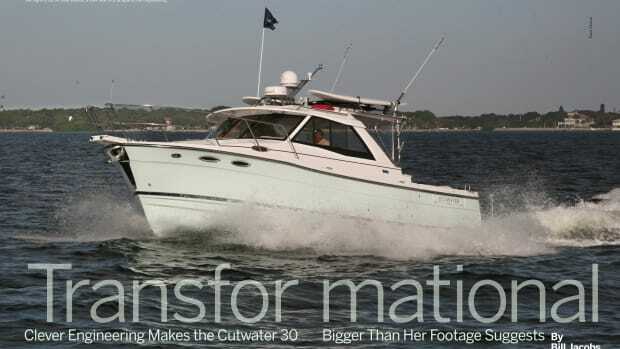 An optional 30 hp Volvo engine with a sail drive and folding prop was added to each boat as a spare engine with a separate fuel supply of an additional 26 gallons. The standard water capacity of 211 gallons was calculated to be sufficient with reasonable rationing. The three boats were shipped from the factory in the Netherlands to the port of Santa Cruz La Palma in the Canary Islands (Robayna’s birth place). After final preparations, the boats departed on December 1, 2008. Each one had an experienced captain, but some of the Russian owners had never been to sea before. They began their voyage with a two-hour run along the coast before setting their autopilots on a course of 265 degrees. When the boats took up this course, the 10-foot northerly swells were on their starboard beam, making for an uncomfortable start to the passage. Some of the inexperienced Russian crewmembers were seasick for the next four days, as rough seas persisted. A hat trick of Russian-owned E4s crossed the Atlantic in 2008. The target speed of seven knots was carefully monitored against fuel usage. The boats averaged about ¼ gph. One of the three boats had a 570 hp engine, in lieu of the 435 hp engines in the other two boats, so its fuel consumption was slightly higher. Generally the boats travelled a good distance away from each other, up to five miles at night. At one point they had to transfer 20 gallons of fuel to the more powerful of the three. The weather during the crossing was fairly benign, with occasional beam seas making life aboard more difficult. They encountered one large thunderstorm with a great deal of lightning, but no damage occurred. 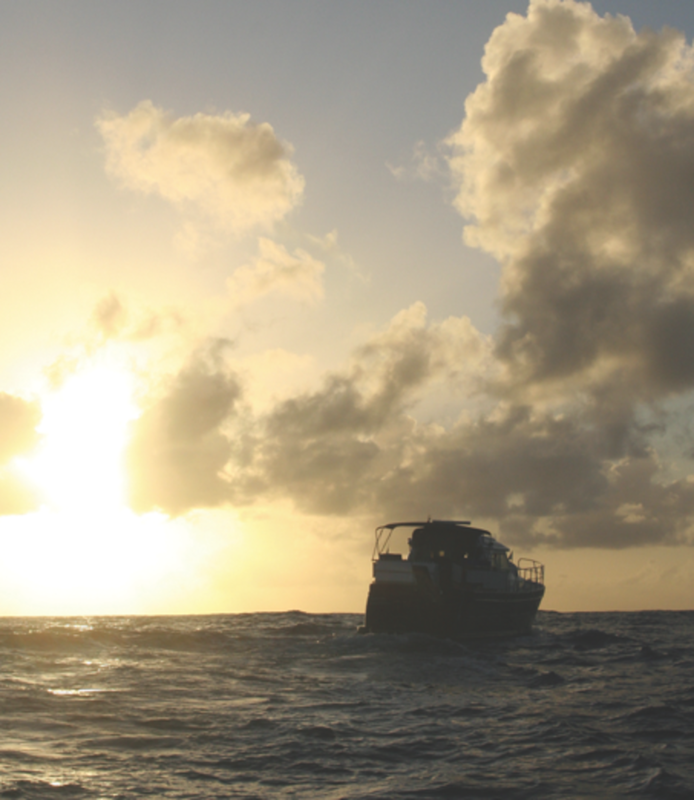 On the 16th day, the mountaintops of St. Martin appeared on the horizon, and not long after, the boats dropped anchor in the calm blue waters of Simpson Bay. The theoretical had become fact: three E4s had made a successful crossing of the Atlantic Ocean. We started my test with a lengthy ride north through the Ft. Lauderdale no-wake zones, passing mansions and megayachts. 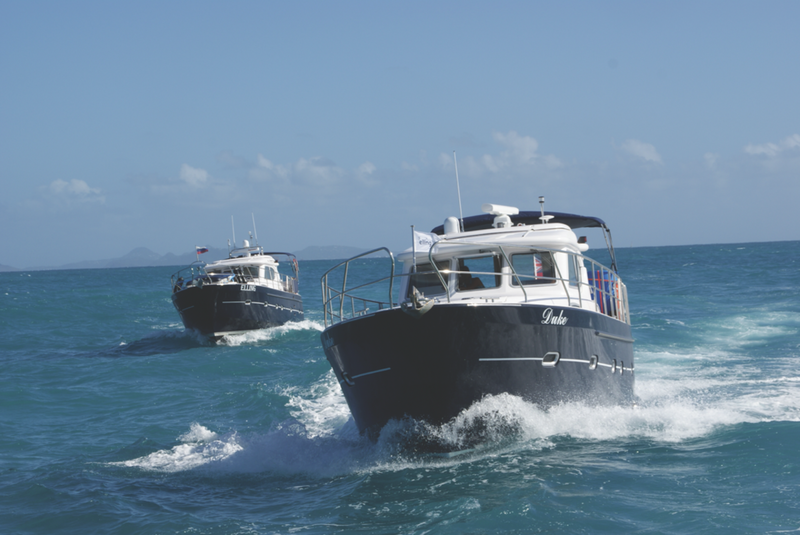 We completed test readings on the boat on reciprocal north and south courses. The soundproofing on this boat is quite remarkable, with less than 15 dBA change from idle to wide-open throttle. When I inspected the boat later, I realized the Aquadrive system was a contributing factor. Fuel usage on the single 425 hp Volvo was equally impressive. Heading into the Atlantic, we had hoped for rough conditions, but the wind had a definite westerly component to its northerly direction, so the seas within a mile of shore were no larger than three feet. Not a true test of her heavy-weather handling. Robayna was anxious to demonstrate the turning ability of the E4, which has a semi-displacement hull. At wide-open throttle, he threw the helm all the way to port. The boat responded instantly and turned within in its own length. Round and round we went. The view out of the large front windscreen was like being on a circus ride as the horizon spun before our eyes. The most amazing thing, however, is that the boat stayed perfectly level without heeling either into or out of the turn. VIDEO: Learn more about the Elling roll test. The other impressive handling characteristic of the E4 is its stopping ability. Robayna shut down the single throttle lever from wide-open throttle at 17 knots, and the boat felt as if it had fallen into a hole in the water. You had to be holding on tightly to prevent being thrown forward. I took the helm and headed directly into the strong, gusty breeze. The combination of the hull shape and spray rails kept any spray from coming over the rails and onto the windscreen. One of the foredeck sun pads was blown loose by the strong breeze, so we executed an unplanned man overboard maneuver to rescue it. It was not clear whether the snaps on the pad were insufficient or whether the pad had been improperly secured: something to be looked into. The single throttle control and steering were very responsive, and we were able to make one pass to pick up the pad from the stern platform. The rest of the day was spent back in the ICW, docking for fuel, tying up for a late lunch and taking photographs of the boat from the dock. As I mentioned, Robayna is a new recreational boater and has owned the boat slightly less than six months and has not had a chance to run her for many hours. 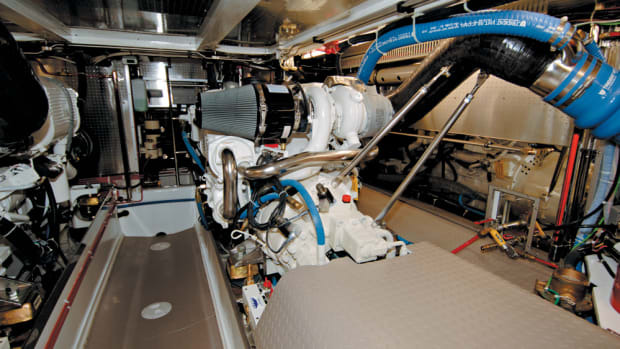 The boat is equipped a single 425 hp Volvo engine and a bow thruster. It is also equipped with a stern thruster; however, due to an electrical problem, it was not operable during the test. In spite of this limitation, Robayna was able to back her into the gusty wind and make a landing alongside a weather dock using just the throttle, rudder and bow thruster. Any reasonably experienced captain could, with a little practice, confidently handle the boat in the most difficult of conditions. The upper helm station is furnished to starboard with a euro-styled trucker’s seat for the helmsperson, with a pneumatic base for shock absorption in heavy weather. It is most comfortable and easily adjustable for excellent visibility. The instruments consist of a Raymarine 15-inch multifunction display, a solid-state Volvo digital engine management display and additional displays for autopilot and depth. On the port side, there is a small but adequate settee surrounding a triangular tabletop. I would expect that if you were to order a new boat, you could probably reconfigure the port side to provide space for a second helm chair, which would not be a bad idea, considering the more than generous settee and dining table in the main saloon below. The forward windscreen features an automatically operated center pane of safety glass that provides a nice breeze through the space. Virtually the entire roof over the cabin can be opened at the touch of two buttons. The first button deflates an air seal that expands between the sliding roof and fixed cabin top, creating a waterproof seal. Once that has deflated, a second button sends the roof silently forward, opening the helm station to the sky. The feeling is similar to sitting in a flying bridge with no stairs to climb. A circular-stepped staircase leads to the main saloon below. It is a thing of great beauty, but I was initially skeptical of the curved stair treads. After using it all day, though, I found it easy to navigate, with solid handholds on either side. 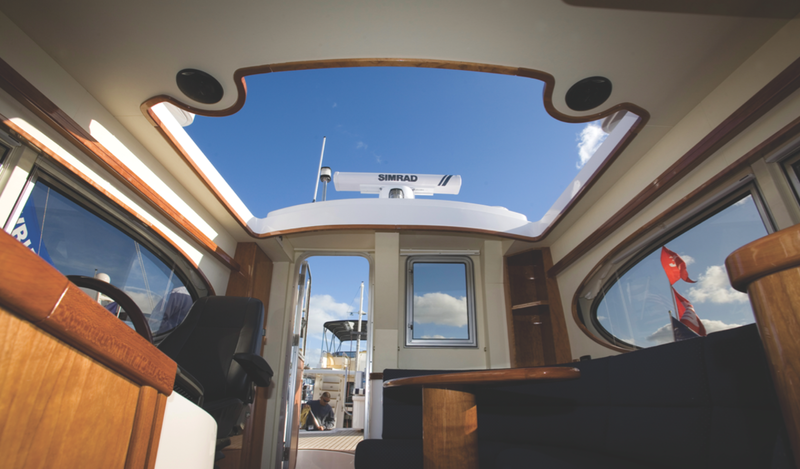 Deployable at the touch of a button, the retractable sunroof really opens up the helm and upper seating area. The spacious main saloon contains a large oval settee to starboard that, including two matching stools, could seat eight for cocktails or dining. On the port side are two built-in lounge chairs flanking a wood cabinet. Concealed inside the cabinet is a flat-screen TV that can be raised by a touch of a button. A pair of hinged doors on the front of the cabinet open to a shallow storage space that might be used to store a chart book. The entire interior below is finished in an attractive, high-gloss cherry finish. Robayna replaced the standard carpeted floor with a synthetic teak and holly sole, which provides secure footing and ease of maintenance. The ultimate aesthetic treatment could be a natural teak and holly cabin sole, which I think would look even better with the cherry interior. 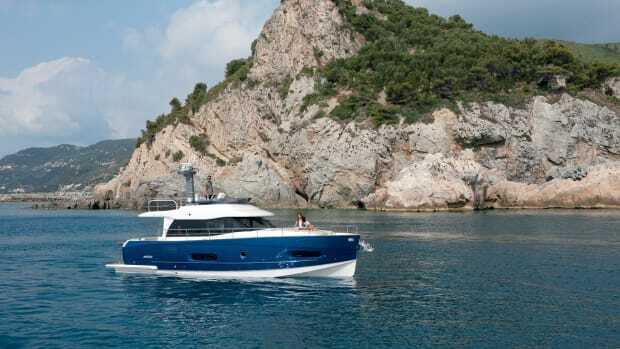 A small cabin to starboard is furnished with two bunk beds, a hanging locker and a removable panel that gives total access to the starboard side of the engine. An optional layout can be chosen, providing a nice office aboard. There is no dedicated head for this or the forward stateroom. Instead there is a large head with an enclosed shower that opens into the main saloon. It is very accessible, but I wasn’t totally comfortable with the door opening directly into the saloon. The forward stateroom consists of two single bunks arranged in a V-configuration. The starboard bunk is 7 feet in length with the port bunk slightly shorter. The portside galley also provides the single passage to the master stateroom, which is not uncommon, but can occasionally cause a traffic problem. The workspace is well laid out, well lit and has plenty of stowage. 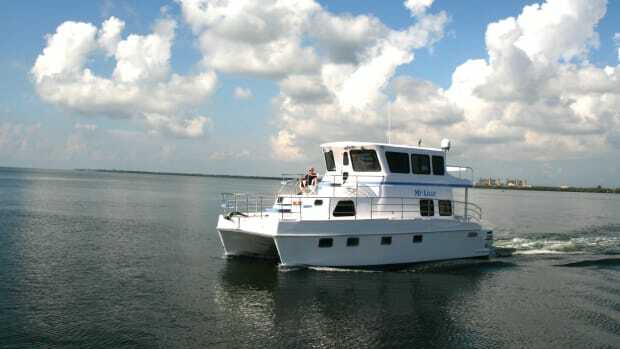 The boat was equipped with the optional ceramic cooktop, a microwave oven and a large vertical refrigerator freezer. The owner’s full-width stateroom occupies the after third of the interior and, in consequence, is very spacious. Even with a centerline queen bed, there is ample circulation space for dressing and making up the bed. There is an opening transom port above the bed, which provides good ventilation but eliminates a headboard surface upon which to stack the bed pillows. A large en-suite bath with an enclosed shower is located on the starboard side of the cabin. There are several well-located concealed doors in the head providing good access to plumbing and air conditioning systems. Stowage drawers, cabinets and hanging lockers are plentiful. The sturdy door hardware that allows access into the boat is typical of all doors and ports. Nicely finished anodized frames support rubber-glazed safety glass throughout the boat. 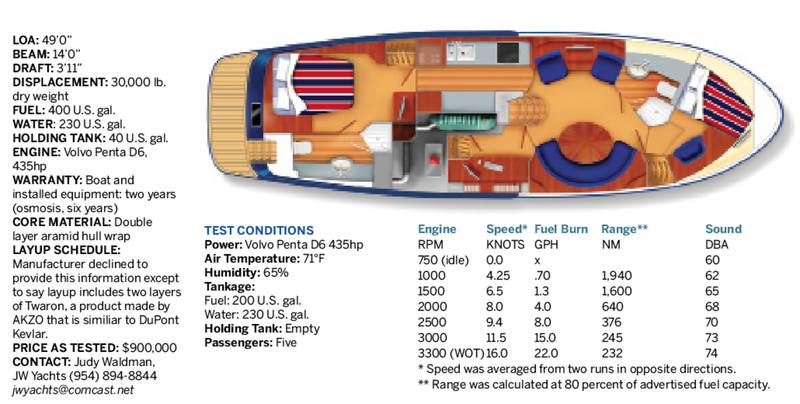 The afterdeck covers the boat’s full beam and is large enough to contain two settees, an adjustable-height table and stair access to the stern platform. My only objection was the rather flimsy hinge and closure on the exit gate. The boat can be easily accessed from the swim platform at a floating dock. Additional side access at deck level is available on both side decks through telescoping sections of the sturdy stainless rails. An interesting detail on each side are stainless steps directly below the entrance gates designed into the side of the hull, providing built-in steps at three levels. It would be hard to find a dock height that would make entrance to the E4 the least bit difficult. The side decks are wide enough to provide easy passage forward and aft, full-length stainless double rails enhancing the feeling of safety. The foredeck incorporates two full-size sun pads and a hinged seat back, which, when deployed, interferes with the helmsman’s view. In spite of the sliding top section, there is a stainless rail holding radar and two communication domes. The fiberglass hull is reinforced with two layers of aramid fibers, a class of strong, heat-resistant synthetic fibers that are used in aerospace and military applications for ballistic-rated body armor fabric (Kevlar) and ballistic composites. In this case they provide an extra measure of protection for collisions. 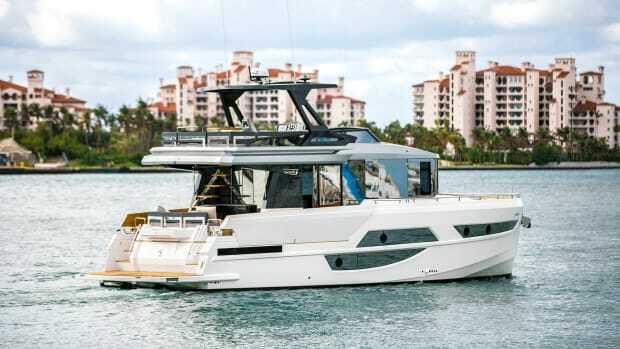 In summary, the E4 is a proven, ocean-capable boat, but by virtue of her shallow draft and excellent handling she would be equally at home on the Great Loop or tooling down the Lauderdale waterways to look at the mansions and megayachts. I’d say Robayna got it right the first time.